The modern science is taking a closer look at the traditional ways – phytochemists are studying the principles of traditional medicinal use of plants, nutritionists are finding answers to a lot of modern health problems in the time proven traditional diets. It looks like we are at the beginning of the very exciting journey of appreciation, reviving and scientific validation of the great wisdom of our ancestors. We are well aware now of the benefits of fermented food and drinks, which have been always a big part of all traditional diets, but have been absent in modern diet almost entirely. It is difficult to overemphasize though the importance of fermented foods for the health of our intestine flora, which is the key factor of our overall health. What we need now is to learn to bring them back to our table – all the variety of delicious cheeses, cured meats, fermented vegetables and brewed drinks. 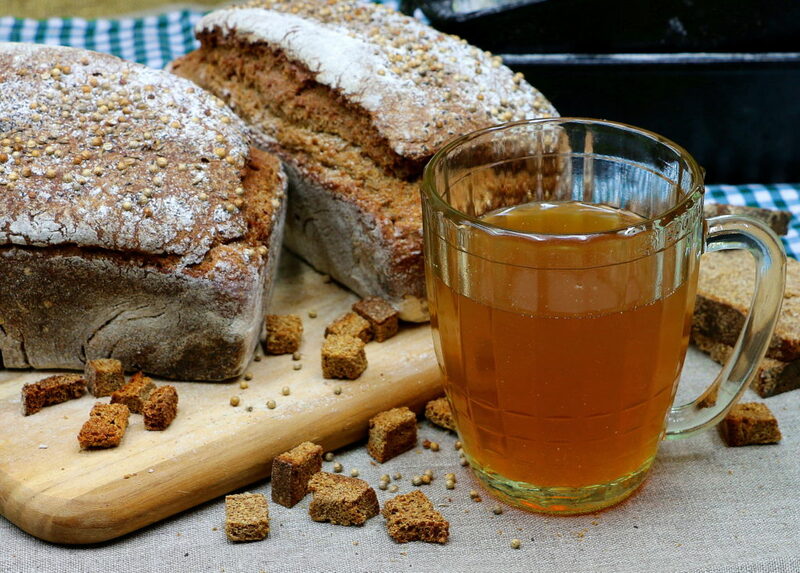 Rye bread kvass is a traditional non-alcoholic fermented beverage that has been, and still is enjoyed by Polish, Ukrainians, Russians, Estonians and other Baltic and east Europeans for at least a thousand of years. It is made of stale 100% rye bread or rye bread making leftovers by a quick lactic fermentation, which results in a very pleasantly tasted , slightly sour drink which is “a tonic for digestion, an excellent thirst quencher and, consumed after vodka, an antidote to a hangover” (Sarah Fallon Morell, WAPF). As its primary ingredient is fermented rye, it is a good source of vitamin B-1, B-3, B-6, excellent source of manganese, magnesium, phosphorus, zinc, iron, and pantothenate. It is also rich in amino acids and enzymes. There are some breweries and bakeries there that are still brewing kvass using traditional methods, but most of the bottled kvass on grocery stores shelves today is nothing but a chemical cocktail, full of sugar, flavours and preservatives. Good thing that kvass is very easy to make at home. The most complicated thing is to find a real, 100% rye, sour dough bread with no additives. For me it is not an issue, as I am baking it once a week anyway. If you are not making your own bread yet, try Whole Foods. I’ve heard they are selling it, imported from Europe. If you have stale bread, cube it in half an inch size pieces and either let them dry naturally, or place them on a baking sheet and bake for 20 min in a 300F oven. If you are using fresh bread, cut it in half an inch size pieces and dry in a 300F oven for 30 minutes and leave them in an oven after you turn it off for another half an hour. The croutons should be completely dry. But they absolutely should not be burnt, not even a little bit. Burnt croutons will make your kvass bitter. Put the rye croutons into a gallon jar and drop a handful of raisins (or any fresh berries) there. Dissolve 4 table spoons of molasses, 2 table spoons of sour dough starter in a glass of filtered, boiled and cooled to the room temperature water. Pour the mixture into the jar with the rye croutons and berries and fill the jar with the prepared water, leaving 2 inches from the top. Cover the jar with folded cheese cloth or a piece of linen and leave it in a warm place (on a kitchen counter), away from direct sun light to brew for 3-4 days. The timing depends on the strength of your leaven and the temperature. What you should wait for is an active fermentation, which you will see by a lot of air bubbles, climbing and bursting on top. Try the kvass in a process. The taste will be gradually turning from mild bready to tangy-sour. As long as you get to the point of active fermentation, the kvass is ready. You may give it another day for more flavour, but the longer you let it brew, the more acid it gets. When you decide that the kvass is ready, put it in a fridge for few hours (overnight). As it cools down, all the lees and bread solids will sink to the bottom of the jar. Now strain the kvass carefully, trying not to disturb the sediment at the bottom. Do not discard all the sediment, because this is your kvass starter now. Stir it well and discard a half, leaving another half, covered with liquid, in a jar. It can be stored in a fridge for up to 2 weeks. 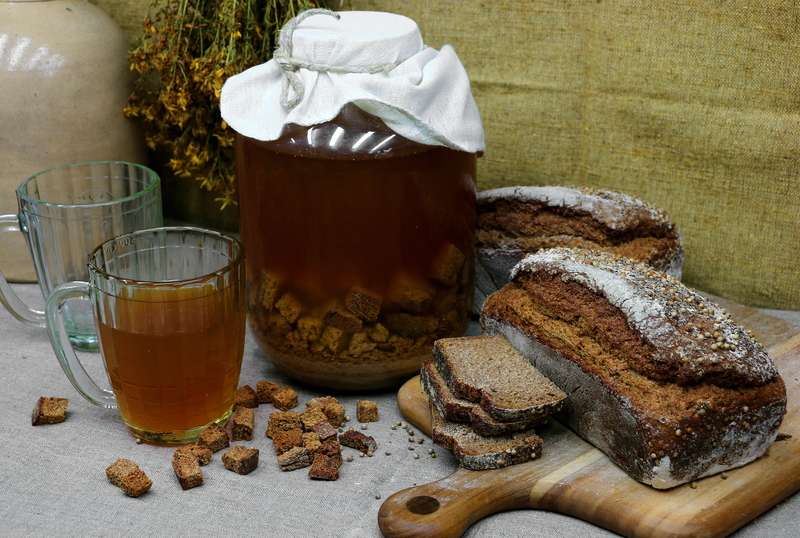 Next time you will be making kvass, use it instead of 2 Tbsp of sour dough starter, and your new batch will be ready in 12-24 hours. And use a bit less croutons with the starter – 150g instead of 200g. Kvass can be safely stored in a fridge for a week. It is a healthy and tasty substitute for soft drinks. It is nutritious, cooling and energizing, as well as an excellent digestive tonic, which you soon figure out you cannot live without. And you don’t have to!